Setting up a reliable Security System is the basic security requirement for both commercial and residential communities. The need for a comprehensive and modernized CCTV Security Camera System, to help alerting the people in-charge about any possible breach. It may be related to theft or it could also be about any accident which can be stopped if alerted in advance. Therefore CompuGeeks have the team of experts. We work in the area of security management with an exclusive focus on CCTV Security System. As a result security system are growing with time and there are numerous updates as compare to the older systems. As a corporate organization or a household, it is important for you to be aware of the vulnerabilities. So you can work accordingly towards installing the Security Systems. Our security system are very helpful and bringing down the human dependence as well as resource expenditure. Since the modern devices are network enabled, cameras can be linked to your personal mobile phones. Once you are aware of the threat perception, it is very easy for you to take necessary action which is the core principle or application behind installing CCTV Security Camera. Our role as expert security advisors and technology providers for the CCTV Security Camera Systems would positively help your business or community. We guide you to make a proactive choice. So you can prefer to self-manage your facilities from the angle of threat perception. Our recommendations are based on your personal preferences and we are completely flexible when it comes to the aspects of cost and expenditure. The best part about our services is that you will be provided with different options with quality variants. You can make an informed decision based on our assessment and orientation. Searching for CCTV Camera Installer near me would be herculean task with a lot of challenges around it if you are not taking the right path. The truth is that Security Camera Installer in Sydney is a specialized service that demands a lot if commitment and dedication. 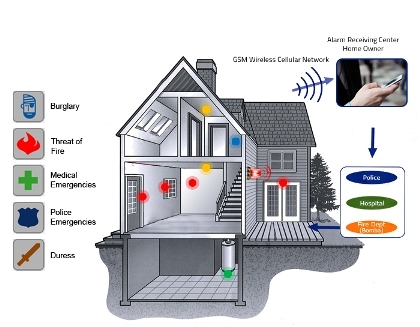 In the same breath, people who require solutions like wireless home security systems need to comprehend with quite a few options that may or may not be relevant. Similarly, companies dealing with CCTV Systems Installation and Security Cameras Installation are bound to offer options that are worth exploring. It is also the expectation from all the customers. In line with what the customers look for in a comprehensive security system that matters a lot for leading a peaceful life in a home setup, the solutions recommended by Compugeeks would matter for sure. This can be said in line with the quality commitment we share with all the stakeholders in our business. Virtues like transparency and collective responsibility towards the user demands have been at the centre of our company’s business model as we prepare ourselves to deliver wireless home security systems. While dealing with services like CCTV Camera Installer and Security Camera Installer in Sydney, we train and orient our teams to that effect to work alongside the user objectives and demands that market throws up from time to time. Security Cameras Installation may appear to be simple from an external perspective, but it has its own share of complexities that can’t be ignored. This applies to CCTV Systems Installation as well. In order to deliver flawless and high-end services, we also ensure there are options that are made available for the enquirers. To that effect, we mobilize resources to match up with the growing demands and requirements we get from different market segment. You can trust us for what we offer. Security Systems for the Home or Office - with over 10 years experience, we guarantee you've made the right choice.